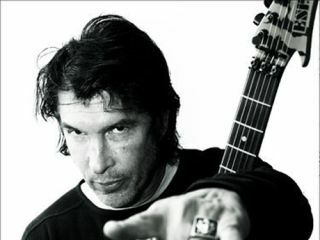 From the Guitar Techniques archive, we ask a famous guitarist all those little questions you really do want the answers to… This time Mr Scary himself, George Lynch. Yeah, Dunlop Ultrex 73. Occasionally I'll use something made of metal, like a coin; and more recently I've been using a hybrid technique, switching between fingerpicking and pick. My old tube Echoplex or T-Rex Replica for delay, my old TS-8 or HBE Paradrive for overdrive, and original 'script logo' Phase 90 or Fulltone Dejavibe prototype for modulation. Or I'd just use my Zoom G2G because it contains all those sounds in one box. For leads I like Zoalla and I prefer medium gauge lamp cord for speaker cable. My original Tiger because I built it myself back in the late'70s - it's dependable and always sounds amazing. Plus it's outlasted four wives and countless bands! My Randall signature Lynch Box - dimed; ie turned all the way up! I adjust the treble side high with heavier strings and the bass side low with lighter gauge strings (as below). Dean Markley Super V's, 11-42. I spent over a year helping to design them. My Dad is a metallurgist so I had some background in metal (no pun).